For those of us who live in the big city, our lives are spent commuting from one place to another. Stuck in gridiron traffic, surrounded by exhaust fumes and beeping horns. Vacations are supposed to help get us away from all of the hustle and bustle, but sometimes they just add to it in the form of flight schedules, hotel accommodations and jam-packed itineraries. So how do we break away, and in doing so, get away from it all? There is still a place left in this country of ours where the pace of life is a little slower, the air is still a little cleaner, and all you have to do for adventure is get up in the morning. This place is the Wild West, and although you may have to deal with a little traffic getting out of the city, once you hit the open road, the only thing stopping you is the ocean on the left coast. Here are a few ideas to help you leave your worries behind, and set out across the American landscape in true road trip fashion. Guest ranches have become a growing destination for vacationers looking to get away from the hustle of the city and experience the slow-paced lifestyle of the country. Families are particularly attracted to ranches as they usually offer a variety of activities to see and do for the young and old alike, as well as providing learning opportunities. Guest ranches vary from place to place. Some offer guests the ability to participate in daily chores, some have activities arranged ahead of time such as hayrides, while others are strictly for leisure and allow you to just soak up the outdoors and go at your own pace. The Double S Ranch in East Texas is molded after the latter. They welcome visitors to spend their vacation the way they want and to appreciate all of the amenities and natural wonders the ranch has to offer. 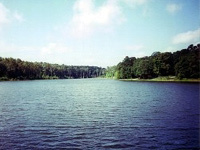 The Double S Ranch sits on 800 acres of secluded land nestled within the Piney Woods of East Texas. Double S is a working cutting horse ranch specializing in the breeding, training and cutting of both Paint and Quarter Horses. The ranch belongs to several professional associations including the National Cutting Horse Association, American Cutting Horse Association, American Paint Horse Association, and the American Quarter Horse Association. The ranch has produced several prize-winning horses. 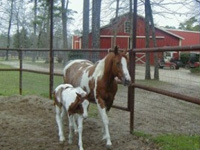 In addition to raising horses, cows, mules and guinneas are also bred at the ranch. For the outdoor adventurer, there are 12 miles of trails that meander all over the property which provide an excellent window into the lore of East Texas. Hikers can expect to see wildlife of all types including deer, squirrels, armadillos, raccoons and multiple species of birds including the occasional Bald Eagle. Spring is a favorite time of year for visitors as the landscape comes alive with the blooming of daffodils, azaleas, jonquils, and of course the state flower of Texas, the bluebonnet. Possibly the most breathtaking of all of the sights is the annually anticipated blooming of the Dogwood trees. The woods on the ranch become lit up, as the white flowers of these trees blossom. There is even a trail on the ranch named after the trees. The ranch also boasts two stocked fishing lakes that are equipped with boats and trolling motors for visitors of the fishing sort or guests who just enjoy the serenity of peaceful waters. Guests are even welcome to keep fish from the lakes for their dinner fare. One of the ponds has a large fishing pier where food is made available for feeding the fish, ducks and geese. The spring fed, crystal clear water of this pond provides a look into the life of the fish in their natural habitat. Golf enthusiasts can also enjoy the Cypress Creek Golf Course that is located just minutes away from the property. This is a nine-hole semi-private golf course that features large and undulating greens that are not only beautiful, but also difficult to read. The fairways are plush, and there are numerous hazards incorporated into the course design. Water hazards (streams, creeks, and ponds) come into play and add to the challenge of this beautiful course. The Double S Ranch offers a stay and play package with the golf course. 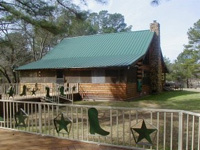 Accommodations at the ranch are provided by Deer Lake Cabins. There are eight cabin/lake houses available for rent that can sleep from two to eight people. Most of the cabins are located on the banks of one of the lakes and have decks that provide the perfect place to sit, relax and watch the sunset. All cabins are beautifully furnished and include full kitchens, televisions, VCRs, central heat and air, and most have washers and dryers. Cabins are also furnished with grills for the benefit of the guests. Guests who are interested in dining out will find many delicious alternatives just a few short miles away. If the laid-back life of a guest ranch seems a little too slow for your tastes, how about white water rafting? That way you get the thrill of speed without having to stop for pedestrians or stoplights. Once on the river, Warren brings a variety of watercraft for guests to try if they wish. The choice of river craft includes hard-shell kayaks, inflatable kayaks, sit-on-top hard-shell kayaks, paddleboats, and large oar boats. The large oar boats are used to carry all the gear and any guests who just want to relax and enjoy the scenery. Even the most timid first-time rafter will gain enough confidence to try each craft at least once before the end of the trip. When not on the water, this country has many more adventures to offer. There are many trails to hike that lead to old abandoned homesteads and gold mines. There are natural hot springs for soaking sore muscles after a hard day running the rapids. Sleep under the stars on the river’s sandy beaches. The crew members aren't only skilled guides, they're excellent camp cooks and they serve meals that will satisfy the heartiest appetites. Whether you’re racing down the Salmon River, strolling through Texas on horseback, or simply taking in the wild nature, the American West has much in store, so hit the roads this summer with a spirit of adventure, just don’t leave during rush hour.